But a warmer, wetter climate may also cause more carbon from plants on land to move into lakes. Greater flow of carbon from plants and soils into Arctic lakes stimulates greater greenhouse gas emissions from bodies of water. And in a largely unstudied region with millions of lakes, it's still a mystery as to how much carbon moves from the land into lakes, and ultimately into the atmosphere. New research by the University of Washington and U.S. Geological Survey suggests many lakes pose little threat to global carbon levels, at least for now. In the Arctic's flat, arid regions dotted with thousands of lakes—a landscape that makes up about a quarter of the entire Arctic region—many lakes are functioning like self-contained units, not releasing much carbon dioxide. "We found that not all high-latitude lakes are big chimneys of carbon to the atmosphere, and that lakes in the region are not actively processing much permafrost or plant carbon from land," said lead author Matthew Bogard, a postdoctoral researcher in the UW School of Environmental and Forest Sciences. "Documenting the heterogeneous nature of northern lakes, as we have done here, will better define the role of Arctic lakes in the global carbon cycle." 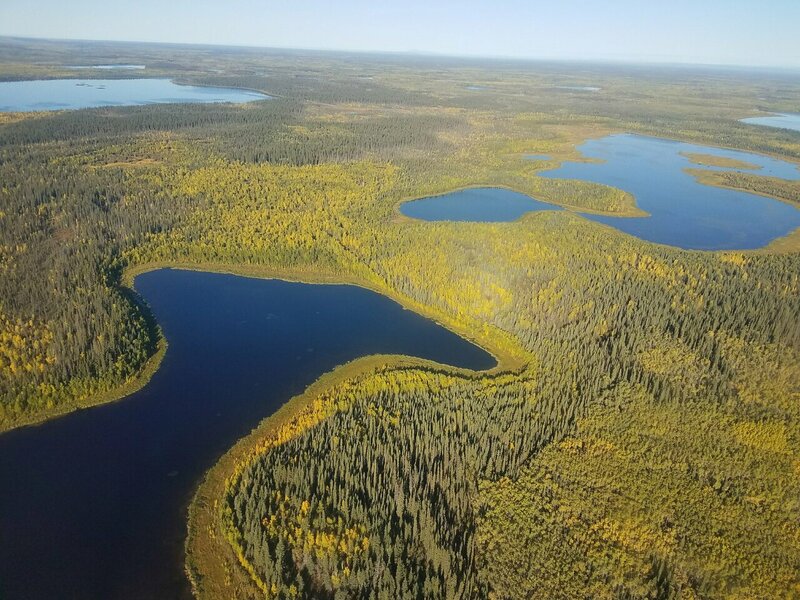 The researchers visited 20 lakes several times over the course of a year in the Yukon Flats region of northeast Alaska: a vast, dry landscape speckled with thousands of lakes and home to the Yukon River, North America's last largest undammed river. Their goal was to track the flow of carbon through the food web and test the water chemistry in each lake for signs of carbon from permafrost across a region that hasn't been studied before in this way. Nearly all of the related research has taken place in a handful of isolated areas in the Arctic that don't necessarily represent the characteristics of lakes in the region, the researchers said. "The problem that we overcame in this study is getting to some logistically very difficult places in order to get a better picture of what's happening across the Arctic, which literally has millions of lakes," said senior author David Butman, assistant professor in the UW School of Environmental and Forest Sciences. "These findings show the need to better understand the diversity of the ecosystems in this region." During each of the fieldwork trips, the research team flew by floatplane from Fairbanks, Alaska, to a remote location in the Yukon Flats National Wildlife Refuge, an area teeming each summer with migratory ducks and other waterfowl. Their accommodations were modest: an old hunting cabin now maintained by U.S. Fish and Wildlife Service for field research provided a safe place to sleep, cook, charge equipment and filter water after long days in the field. Black bears and moose are common in this area, evidenced by large spikes on the cabin's doors and windows to keep animals out. Each day the researchers flew from lake to lake, collecting water samples while kneeling on the plane's pontoons and dropping probes into the water to measure temperature, dissolved oxygen and other lake characteristics. On a good day, two researchers and a pilot could hit eight different lakes, sometimes having to leave one person behind for part of the day if the lakes were too shallow to take off with a fully weighted plane. "The implications are that not all lakes are hot spots for releasing carbon from land," Butman said. "But we don't yet know how these particular landscapes will change in a warmer climate, since this is the first time they've been studied." As the climate warms, large wildfires are expected to sweep across the Yukon Flats, potentially delivering an enormous load of land carbon to the lakes in this landscape that could stimulate more carbon dioxide emissions. The research team's current and future work will help benchmark what's happening now to better understand future changes.